Our rock climbing summer camp program is for 8 to 17 year-olds with skills ranging from beginner to intermediate. As a beginner, you will receive a fun introduction to the sport. If you already have some experience, you'll get an opportunity to improve your skills. You'll go through climbing clinics supervised by a climbing director certified by the National Outdoor Leadership School (NOLS) or the American Mountain Guides Association (AMGA) as a Single Pitch Instructor. You'll learn communication and safety protocols, basic top rope rock climbing techniques, knot tying, belaying, and rappelling. Safety is paramount, and all participants not only go through our clinic but wear a helmet and harness. 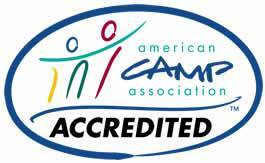 The Camp observes the "Challenge-by-Choice" philosophy. You can choose the difficulty of your climb, from introductory to more challenging, all the way up to our most challenging climb. It's entirely up to you. You will get all the encouragement and guidance you need without being forced or compelled to do anything with which you are not comfortable. We're just happy to have you join us! Like mountain biking, you can go rock climbing without enrolling in our specialized Rock Climbing Program Track. However, if you love climbing, then this program is for you! 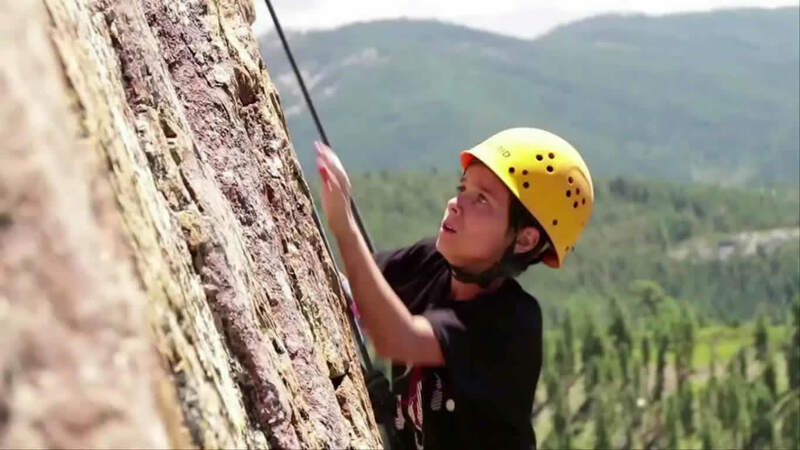 The rock climbing program track is for campers age 8 - 17 with skill levels ranging from beginner to advanced-intermediate who are staying 2 or more weeks and who want to focus on rock climbing. (You'll still have about half your time for trying all our other fun activities at Camp.) While in the climbing program, you will attend clinics on climbing techniques, including hand, foot and body moves, learning such things as heel and toe hooks, smearing, edging, crimping, pinching, palming, stemming, flagging, lay-backing, and manteling. 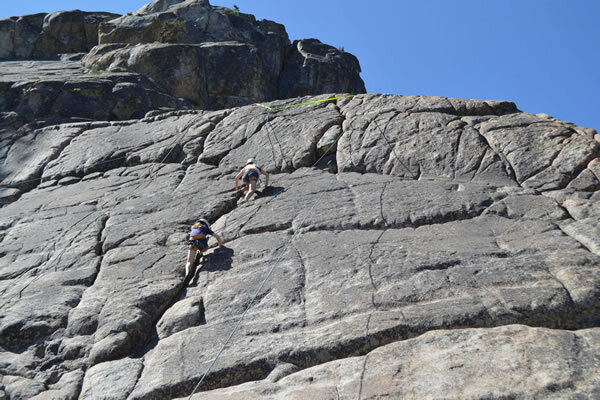 We use a bouldering wall, natural boulder fields, and natural granite walls. In addition to basic climbing moves and techniques, you'll learn knots, belaying, rappelling, and mock sport climbing. Watch the climbing video to learn more. 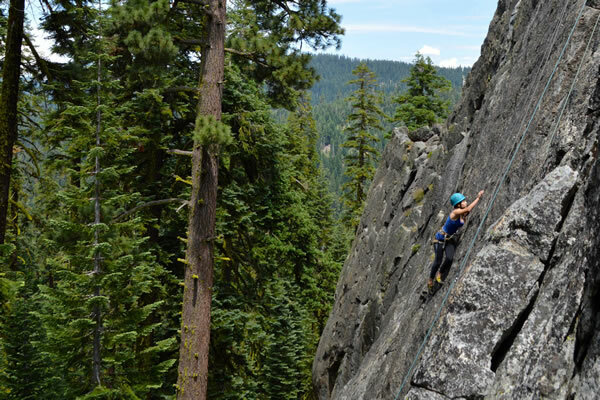 Within two miles of Camp, the climbing site consists of a huge loaf of granite hidden among the very tall fir trees, with a climbing face with dozens of potential routes on each side. In fact, one side has an inverted face making for a thrilling and stomach-churning rappel! 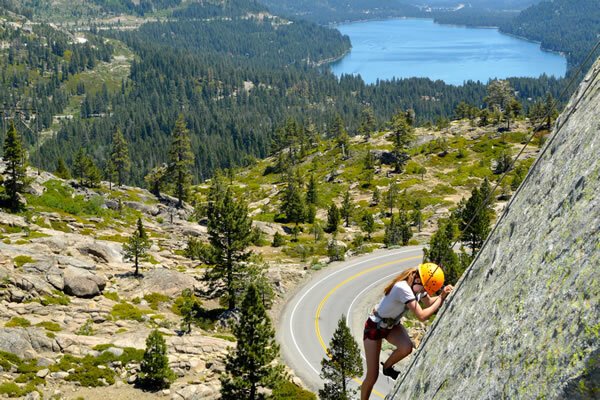 Made famous by the ill-fated Donner Party which tried unsuccessfully to cross the Sierra Nevada mountains by wagon train in the 1800s, this large lake provides a beautiful view for our rock climbers. It is well known in rock climbing circles for the great variety of fun climbs. The Camp runs a full day trip to Donner Lake only during our sessions of two weeks or longer. 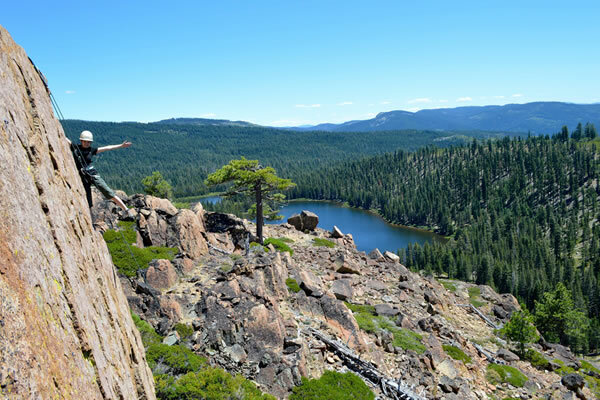 Another of our favorite climbs is in the Sierra Buttes area, where you can not only climb some great routes with the scenic Buttes providing a beautiful backdrop, but you can go for a swim in a lake afterward. By this, we mean we use many sites that, as far as we can tell, have been undiscovered by the public and we have all to ourselves!